Queer media studies has mostly focused on lesbian, gay, bisexual, transgender, and queer (LGBTQ) visibility, stereotypes, and positive images, but media technologies aren’t just vehicles for representations, they also shape them. How can queer theory and queer methodologies complicate our understanding of communication technologies, their structures and uses, and the cultural and political implications of these? How can queer technologies inform debates about affect, temporality, and publics? This book presents new scholarship that addresses queer media production and practices across a wide range of media, including television, music, zines, video games, mobile applications, and online spaces. 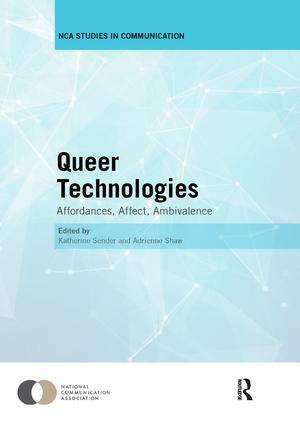 The authors consider how LGBTQ representations and reception are shaped by technological affordances and constraints. Chapters deal with critical contemporary concepts such as counterpublics, affect, temporality, nonbinary practices, queer technique, and transmediation to explore intersections among communication and media studies and cutting-edge queer and transgender theory. This collection moves beyond considering LGBTQ representations as they appear in media to consider the central role of technologies in understanding intersections among gender, sexuality, and media. Even the most heteromasculine technologies can be queered, yet we can’t assume queerness works in the same way across different media. Emergent media technologies afford queer worldmaking, but these worlds are forged between normalization and niche marketing. This book was originally published as a special issue of Critical Studies in Media Communication.